Traveling Sardine Class: Still, it taunts . . . I've stepped away from the phone and the computer, relatively speaking, since the mandatory evacuations were lifted. We're no longer expecting a deputy knocking at the door or a reverse 9-1-1 call which kept me close to home. 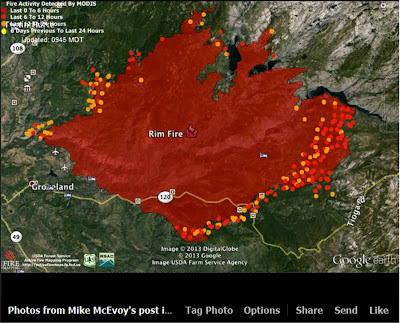 Did I include any of the graphics about the behavior of the Rim Fire, still burning around and encroaching into Yosemite National Park? I know I didn't include this one, which is provided as a comparison of the size of the fire with the cities of the San Francisco Bay area. Click on it and you will see a tiny airplane on the lower edge of the western point of the yellow. That's where I live. Close enough. This comparison is a day or two old. 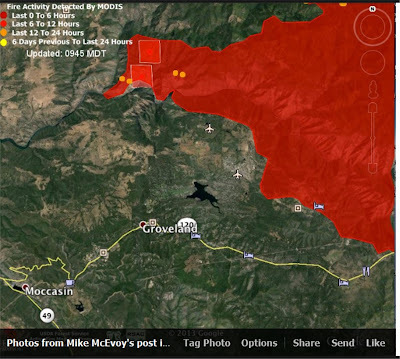 The report at 7 p.m.tonight pegged the area burned as 199,237 acres, 32% contained. They're expecting full containment by September 20. September 20! It started on August 17. Fire behavior is still rated as very active, with 4,927 personnel involved. The most up-to-date release about the incident can be found here. One thing to keep in mind in looking at maps is NOT to assume that everything within the perimeter is gone. The firefighters take mighty stands where people live, so there are enclaves within the perimeter of areas not burned. These are maps from last night. The almost solid brown-red is not part of the color coding. This is a chart of the first time fire activity was recorded in a place. 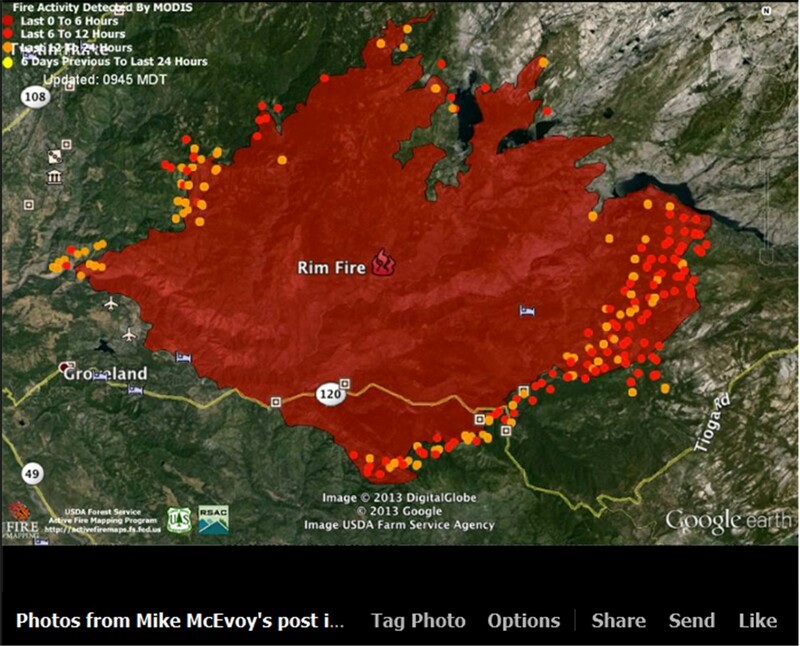 This gives an overall view of fire duration, with the bright dots somewhat more recent. 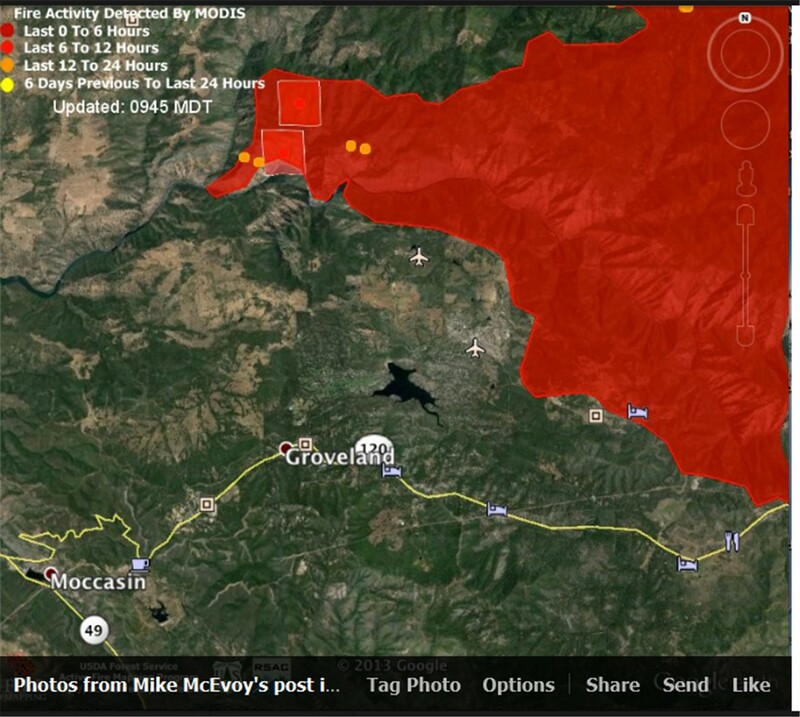 The bright red squares are newer activity, so we still have these nearby areas that flare up and put out plumes of smoke, and the aircraft activity overhead resumes. Just enough so we can't really relax in our area. It's not over yet for people on the other fronts. I live about a quarter of the way from the lower little airplane and the lake that looks like a little animal with a long tail below. See? Taunting plumes of smoke. I've learned a new term: pyrocumulus -- fire-created cumulus clouds. (I don't know whether that's the official definition. I'm going by context.) These are shots from Monday, August 26, from downtown. When I got home, I took a walk up the hill to see what it looked like in the neighborhood. There are signs of fresh heat beyond the tree tops, but the smoke more and more stretches horizontally along a broad line, rather than in towering plumes. Uncharacteristically, I continued on around the block. There were people to be seen in and around some of the houses. Coming home. This little -- actually, pretty good sized -- weather vane whirled vigorously and it was hard catching this side view. This is a favorable wind direction for us now. On Tuesday I had a dental appointment in the Little City Down the Hill. At almost noon, the smoke down here is thicker than at home. But the fire is closer here now than it has been. No break from the smoke here. When I get back to My Little Town, there's another big new plume out in the distance. Later in the day, little clouds that had been skittering around, begin to looks like they might develop into something -- hoping for rain without lightning. Let's not forget this is Thursday and I haven't done a Thursdays Out at NeedleCrafts for quite awhile. I've taken a photo or two from time to time, but not enough to carry a whole blog, so I owe a little catch-up here. This is Judith, just returned from wintering in Hawaii, all tanned and healthy. The person with the arm, who shall remain nameless, is leaning out of frame so as not to display her winter white look. This is from earlier in the summer. Just loved all the colors in this pile of yarn. For months, Paula was crocheting all these blocks. She's making an afghan for ... someone. . .
. . . and the due date is drawing near, so she puts them all together. Not only is this soooo-soft yarn, I love the sparkly label. Today Barbara came in with a pumpkin, a knit pumpkin. It's larger than it appears here. It's pumpkin-sized. She is working on the leaves. Today I finished this block for my Tile Quilt, made with French blue and white fabrics. I think I've gotten through a total of five. My plan was that I could work on this for years and years so I wouldn't have to think of new hand projects but I went through a list of planned and in progress hand projects that moved into my new quilting room from the storage shed, and I want to get to them, too! We're eating out locally these days. A lot. This should be the big season before the winter lull for our local merchants. We have lots of fire-related personnel in town, but not the usual Labor Day weekend tourists going to Yosemite, nor to a big music festival up the road which had to be cancelled. They count on this trade to tide them over the winter and they have lost out. Daughter is coming up for the weekend to bring back the things she evacuated from my house, so we, Sister and Brother-in-Law will foreswear cooking and dishwashing in favor of contributing to the local economy! The Incident Report writer today sure needs spell check. I'm glad you are not under evacuation anymore. But I think your reporting has been stellar. Good job Lee.